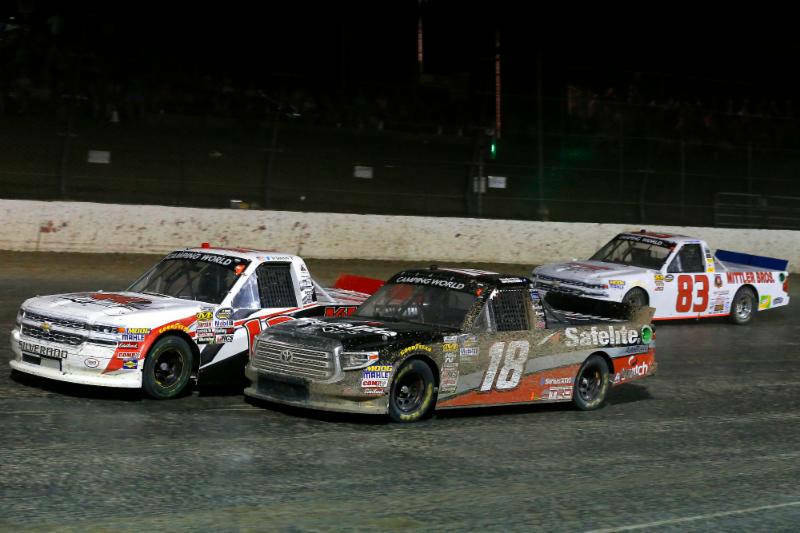 If you are wondering why Las Vegas Motor Speedway has invited the K&N Pro Series West to race on its dirt track during its September NASCAR Weekend, you weren’t watching Wednesday night’s Truck Series stop at Eldora Speedway in Ohio. If you are wondering why Las Vegas Motor Speedway has invited the K&N Pro Series West to race on its dirt track during South Point 400 weekend in September, you weren’t watching Wednesday night’s Truck Series stop at Eldora Speedway in Ohio. Chase Briscoe edged teammate Grant Effinger in a photo finish after their trucks banged into each other en route to the checkered flag. Watching the trucks go slip-sliding away around dirt track corners once a season has proven to be a major hit. The inaugural Las Vegas K&N race on dirt will be Thursday before the trucks and Xfinity and Cup Series cars invade the superspeedway Sept. 14 to 16 for the first NASCAR playoff race of 2018. There’s a chance a guest driver or two may join K&N regulars such as 17-year-old female racer and budding star Hailee Deegan. “We’re working on it, but part of it is getting cars to match up with drivers and a manufacturer,” LVMS spokesman Jeff Motley said. It most likely won’t be a Cup Series driver involved in the playoff chase. But if the stars line up, one of the nonplayoff drivers or perhaps one from the Xfinity Series could be coaxed onto the dirt oval. You can probably rule out Noah Gragson, however. After struggling from 27th on the starting grid to a decent sixth at the finish at the Tony Stewart-owned Eldora oval, the Las Vegas youngster indicated he was happy to be leaving Ohio. It’s rare when a NASCAR driver directly responds to something written in the newspaper or online or in a restroom stall near pit road, for that matter. But after reading in this space about action sports star Travis Pastrana losing a bunch of his own money after a brief foray into NASCAR several years ago, current Cup Series driver David Ragan fired off a tweet. We can talk about tracks, formats, downforce, cars, and star power all we want. But until the cost of being competitive in NASCAR top 3 series is less. We will never attract and retain outside stars like Travis. His quote is spot on. Have Kyle Busch and Ricky Stenhouse buried the NASCAR hatchet after the latter took out several fast cars, including one driven by the former, during the recent Cup Sereies race at Daytona? The answer is yes. In each other’s back. When: Friday, qualifying, 1:45 p.m. (NBCSN). Sunday, race, 11 a.m. (NBCSN). When: Saturday, qualifying, 8:05 a.m. (CNBC); race, 1 p.m. (NBCSN). When: Saturday, qualifying, 6 a.m. (ESPNEWS). Sunday, race, 6 a.m. (ESPN2). Where: Hockenheim Ring, Hockenheim, Germany. When: Sunday, finals, noon (KVVU-5). Where: Bandimere Speedway, Morrison, Colo. Defending champions: Antron Brown (Top Fuel), Robert Hight (Funny Car), Drew Skillman (Pro Stock), Eddie Krawiec (Pro Stock Motorcycle).